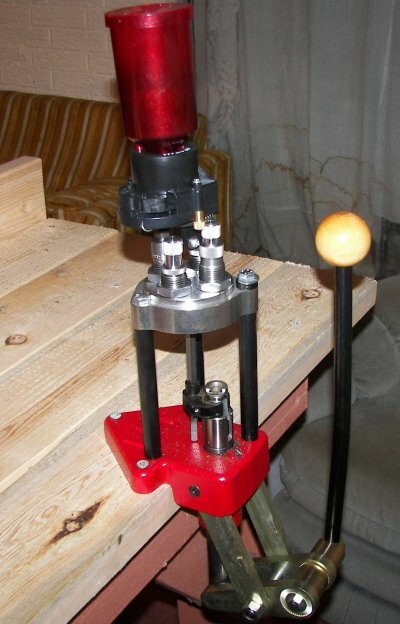 For those of you perusing this web site looking for reloading information, my basic low level reloading status may be a big plus. It will help you get started without the mass of confusion I sorted through when I started out. I had to figure out what equipment to buy, what brass, bullets and powder to use, how to do it without my bullets blowing up, etc. I reloaded quite a bit about 30 years ago. 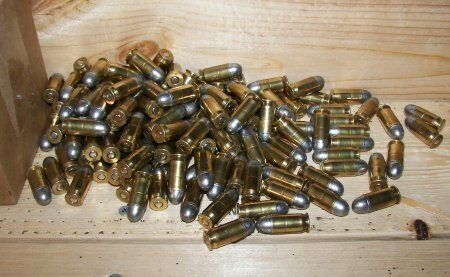 It was all .357, .38 special and .44 magnum loads for revolvers which was all I owned. I did quite a bit of it and did it successfully and safely. But things change over a 30 year period. When I got back into shooting in a big way and consequently back into reloading, I found way more information than I was looking for. On a detailed web site dedicated to reloading, the information will leave the starting reloader with the idea that you have to be a scientist cerebral enough to make Albert Einstein look like he has a small forehead. 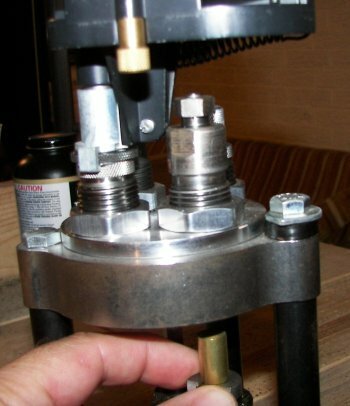 So, I pondered it a while and figured it would be to the beginning reloader's advantage to read about reloads that go to the simplest and safest techniques. That while still turning out enough handgun bullets to make it worth your while. And you will only find information from me here that will lead to loads that fall between recommended powder charges without pushing the envelope. 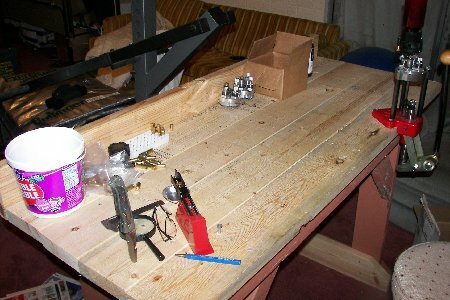 I'll start out on this page by talking about the work bench and area. That's not something most want to think about. If you're not willing to put a little money and effort into a work area, just save your time and money and buy factory. The work bench must be STURDY. That means 2x6 and 2x4 solidly assembled bench sturdy. The one shown below is an old work bench that I repaired, replaced wood on and put a backstop on. Don't try to use a bench without a backstop. You will have more stuff dropping off the table than staying on it. That table is about 6' long and sits in a corner of our sun room. Next to it, not pictured is an old roll top desk with lots of slot holes and drawers that hold all my supplies, charts, tools, dies, etc. Once your reloading table and area are set up then you can concentrate on the biggest single investment in equipment, the loader itself. Reloaders come in the simplest, single hole, single die machines that you can load a few rounds per hour with through progressive machines that claim a production rate of over 1000 rounds per hour. Here is one thing that is universal among beginning hobby reloaders. All of us think we are going to need to reload more than we actually are. I imagined thousands of rounds per month at first. While I shoot quite a bit compared to the average gun owner, I don't come close to needing the reloaded ammo that I imagined when I began to look into all this. So here is where I can probably save you some time and money. Remember also, that no machine is permanent. If you buy one and it becomes too slow for the amount you shoot, you can always sell it and upgrade. That's typical for people who progress in their shooting. I initially looked at several different machines by several manufacturers. Then I narrowed it down to 3, then 2 and that's where I finally made my decision. My final decision was between two machines. One was a Dillon 550B that claims a production rate of up to 500 rounds per hour. The other was a Lee Classic Turret Press with auto indexing claiming a production rate of up to 200 rounds per hours. A significant difference, but a significant difference in price and ability to buy accessories. The first machine I settled on after much stress, was the Lee Classic Turret Press. Now I didn't have the Dillon to compare it to for this article, but I was not sorry for my decision. Realistically, it produces plenty of ammo in a reasonable amount of time for the shooting I did when I bought it. The Lee Turret press did a great job and is still used alongside my Dillon that I acquired later. The "auto indexing" feature allows you put in a 4 hole turret (to hold 4 dies) to move one bullet to 4 stages until fully loaded by simply pulling the handle, if you use all accessories available. However, I use the 4 hole turret loaded with dies to do single stage operations to multiple shells before moving to the next stage. That gives me a measure of safety that I would not be comfortable without. Using the Lee Press for a while, I've found that using it without the center rod, and simply moving the die holder by hand is faster, simpler, and absolutely dependable. 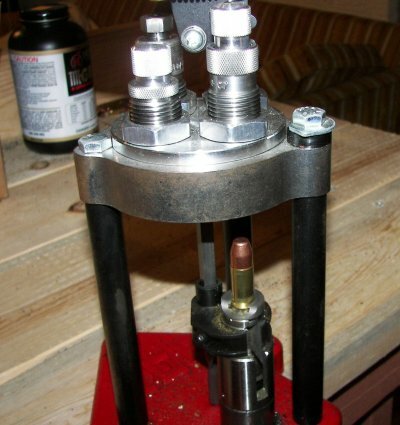 This machine will turn out enough handgun ammo to satisfy most hobby and recreational shooters. 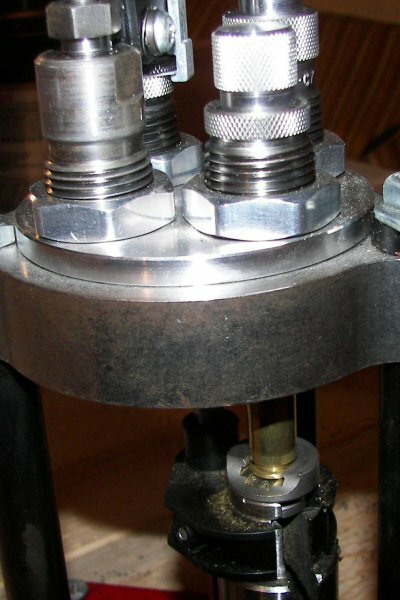 Below are the basic steps from cleaning the cases to turning out the bullets with the Lee Turret Press. The first step that I take is to take up to 300 cases or so and tumble them in a case cleaning tumbler. 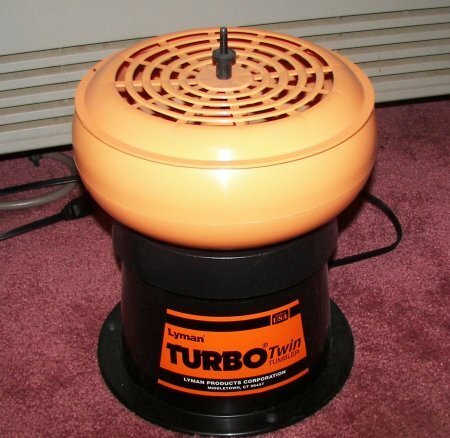 The one I use is the Lyman Turbo Tumbler below. I believe my tumbler was somewhere around $60 and comes with 2 size bowls and a "sifter" top which is basically useless. You put some kind of abrasive cleaning media such as corn cob or walnut, put the cases in, and turn it on. Leave the room because it is kind of loud. The tumbler does a good job of cleaning the grit and powder residue off the cases. To sift the cases to remove the media, I use a spaghetti strainer. Works great and completely clears out the media after cleaning. Next I de-cap the spent primers in all cases to be loaded by using the press to insert them in the de-capping die. I put a large box underneath the press to catch the spent primers. I then prime the cases with a Lee Auto Hand Primer which holds about 100 large or small primers. An empty case is placed in the holder, the handle squeezed, primer inserted, case pulled out, new primer falls into place. It's quick and you can check each one quickly as you go. Next is to charge the cases with a predetermined amount of powder that is set up in your Lee Auto Powder Measure and die. 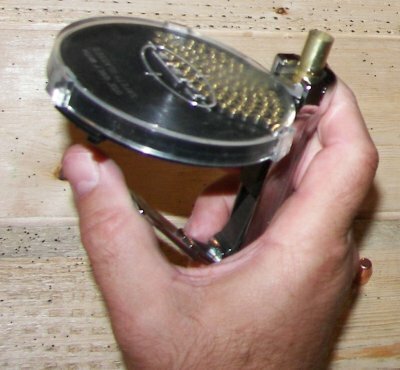 The measure fits into a die, the bullet is raised into the die triggering the release mechanism of the measure releasing the powder into the case. This movement also sizes the case and flares the case mouth to receive the bullet. I do about 50 at a time and check each load with a flashlight before going on to the next step. Next, the case and bullet are put into the press and raised into the bullet seating die. You will have set the die to seat the bullet at a determined depth and every bullet will be seated the same. 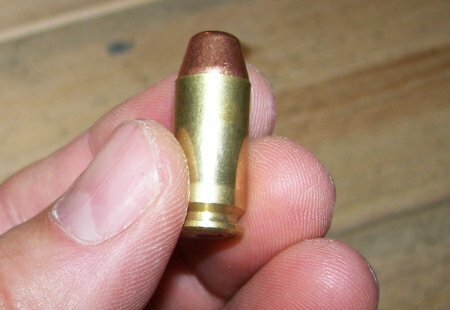 Finally, with some bullets it pays to put it through a final case sizing and crimp die to pull the entire bullet down to uniform size. 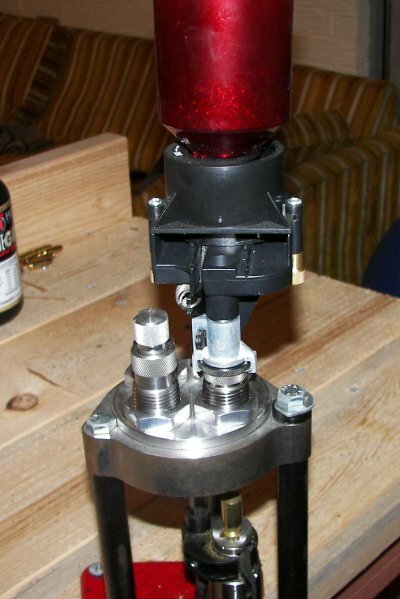 This eliminates the possibility of a bulged load that could lead to jamming or other more serious failure. I size all my .40 caliber bullets after seating. Now through all this you have to have loading data for cases, powder, primer, bullet weight, bullet composition, etc. That's not all as complicated as it sounds or as complicated as some people make it if you're not trying to make some kind of exotic loads or doing something intentionally dangerous. The place to find loading data is not from a bunch of hobby reloaders' web sites. The place to find accurate, modern data is on the web sites of powder manufacturers. They will give extensive load data for each type of powder they sell.